Finally! Brides Can Now Look Natural And Absolutely Beautiful On Their Big Day Without Spending A Fortune! "Professional Makeup For Brides" Is A Step-By-Step Instructional DVD That Will Show You, The Bride To Be, How To Look Naturally Beautiful On Your Wedding Day. Learn How To Create Big, Beautiful Eyes! What Color Eye Shadows To Choose And How To Apply Them! How To Match A Foundation To Your Skin Tone! 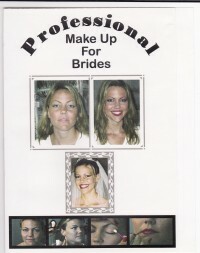 The "Makeup For Brides" DVD Was Produced By Professional Makeup Artist, Jean Lewis. In It, Jean Takes You Into Her Personal Makeup Studio And Begins A Wedding Day Makeup Session On Molly, A "Soon-To-Be" New Bride. Watch And Learn Step-By-Step As Jean Transforms Molly Into A Radiant And Beautiful Bride! Jean Has Had The Delight And Pleasure Of Personally Doing The Wedding Day Makeup For Literally Hundreds Of Brides! It Remains One Of Her Favorite Areas Of Makeup Artistry. This Professionally Produced, One-Of-A-Kind DVD Is Long Overdue And Has Already Been Purchased By Scores Of Satisfied Brides Nationwide. Learn The Secrets Of Doing Your Own Wedding Makeup From A Professional Who Has Worked With A Near Countless Number Of Brides And Charged The Big Bucks To Do Their Wedding Day Makeup. Now, You Can Learn From Jean How To Do Your Own Makeup For That Special Day Saving You A Lot Of Money While Still Looking Absolutely Beautiful! In This DVD Jean Demonstrates Step By Step By Actually Making Up One Of Her Brides. She Instructs You On What Products To Use And Of Course How To Apply Them To Create That Natural, Soft (Anti-Aging) Look That Every Bride Wants. Following Jean's Easy Step By Step Lesson Plan Will Leave You With Complete Confidence That Your Wedding Photos And Video Will Capture You Looking Stunningly Beautiful! As A Bonus You Can Share The DVD With Your Attendants And Bride's Maids So That They Too Can Look Their Very Best! Don't Leave Your Looks To Chance On Your Once In A Lifetime Day...Order Your Copy Now! This DVD Is Also Makes An Excellent Training Tool For Makeup Artists Who May Be Inexperienced In Applying Bridal Makeup And Are Looking To Learn The Techniques And Proper Products To Use In Wedding Makeup! Click Below To Order Your Copy Of Professional Makeup For Brides. Please Note That Due To Content, All Video And Books Sales Are Final. No Refunds Will Be Made. In The Case Of Videos Or DVDs, If An Item Is Proven Defective, Please Contact Us.